This section explains how to modify the build configuration of SOFA and attempts to document the available options. Cmake stores the options in a cache (CMakeCache.txt) for the next time you run any cmake tool. If you want to start over from the default configuration, or choose a new generator, select File > Delete Cache. 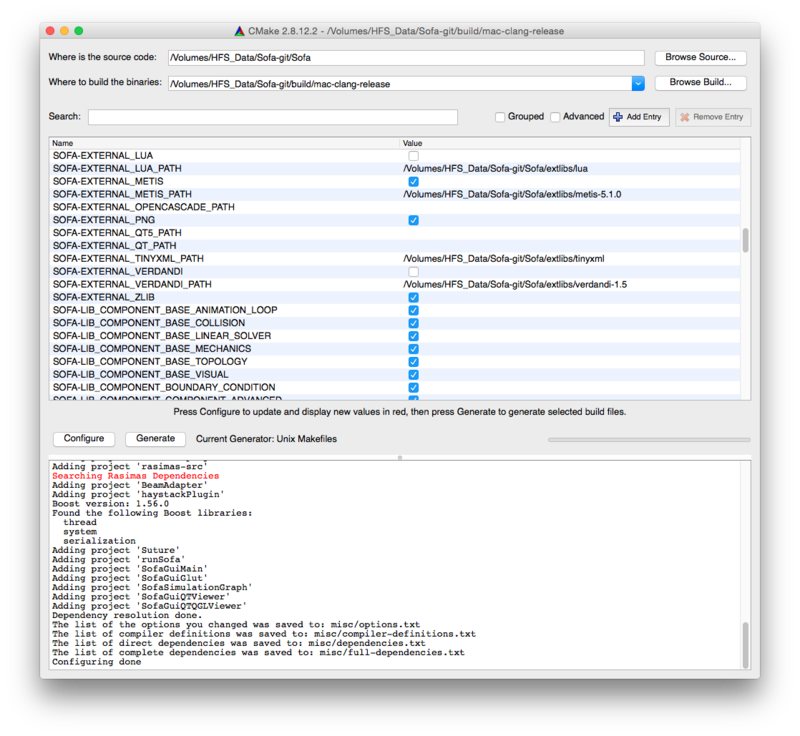 For example, the SofaPython plugin (applications/plugins/SofaPython) is enabled by the option PLUGIN_SOFAPYTHON, and the runSofa (applications/projects/runSofa) is enabled by the option APPLICATION_RUNSOFA. CMAKE_BUILD_TYPE : the typical values for that field are Release and Debug (even if there are other options like ReleaseDebInfo, there are not really used by SOFA internal developers and thus, not really tested). Like the value is indicating, Release value indicates to compile in Release mode, with optimizations for speed, size of binaries. Debug value makes it compile with the debugging symbol activated and no code optimization. SOFA_EXTERNAL_DIRECTORIES: path to external directories, this can be especially useful to build external plugins with SOFA. For more informations, please read the documentation about Building a plugin. SOFA_BUILD_TUTORIALS : this options activates the build of all tutorials located in applications/tutorials. SOFA_BUILD_TESTS : this option activates unit tests for SOFA. For more informations, please go to the Tests page. SOFA_FLOATING_POINT_TYPE : this option determines the type(s) (float, double or both) used almost everywhere in SOFA when a floating point type is explicitly needed: the SReal type. This option also defines which "versions" of each templated component will be compiled (float, double or both instantiations). Note that using double will significantly reduce compilation time, but then you will only be able to simulate scenes that contain exclusively components using template parameters based on double (Vec3d, Rigid3d, …). More technically, this will respectively activate or desactivate the macro SOFA_WITH_DOUBLE and SOFA_WITH_FLOAT in the code. SOFA_DUMP_VISITOR_INFO : enabling this option allows to get more debugging informations at each step of the simulations. For a more complete description and how to use these informations, please go to the Profiling part. SOFA_NO_EXTERN_TEMPLATE : this option (false by default) enables the use "extern template" in the code of SOFA. It will be always be activated for DLLs on windows. On some platforms, it can fix RTTI issues (typeid / dynamic_cast), and it significantly speeds up compilation and linking on every platform. More information here: Shared Libraries Mechanism. SOFA_NO_UPDATE_BBOX : this optimization flag desactives the computation of the bounding box at every timestep of the simulation. SOFA_USE_MASK : this activates an optimization done to run simulation involving masks (a subpart of an object). However, this features is known as sensitive when used with constraint algorithms. Set false by default. SOFA_WITH_EXPERIMENTAL_FEATURES : activates some experimental work in progress. No garantee on code quality or compilation is given. However, this gives early-access to new functionalities in SOFA.